Commissioner of Agriculture, Mr. Julius Johnson, speaks at the 2014 Annual Meeting of the Knox County Cattlemen's Association. The 4-H spring cattle show is sponsored by Knox Cattlemen. 4-H members in Knox County are encouraged and educated in cattle production. Knox Cattlemen sponsor "Ag in the classroom." 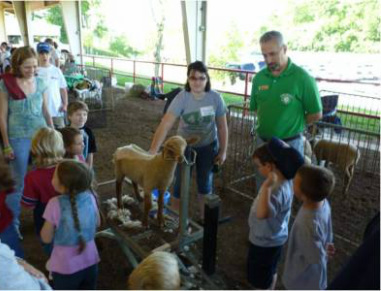 A program of the Knox County Farm Bureau, which introduces urban school children to agriculture. Knox County Cattlemen gather for 2013 Summer Picnic. Picnic entertainment was provided by the Clinch Mountain Band. Natalie Fletcher. a student at UT Martin, is presented with a one thousand dollar scholarship by Mr. Danny Penland, President of Knox County Cattlemen's Association. 4-H members James Dunn (right) and Rain Larson (left) received 250 dollar scholarships for camp. Their teacher, Mr. Mike Blakenship of North Knox Vocational Education, is pictured in the center.